Releasing their major label debut in 1997 with the album Middle of Nowhere, Tulsa, Oklahoma band Hanson has always been known as an ambitious act, consistently coming up with new ideas to not only keep themselves busy, but also their fans. With their new double album, String Theory, the group has pushed the envelope once more, by taking 23 well known hits, little known songs, and unreleased b-sides and backing them with an orchestra, something the band has always wanted to do. 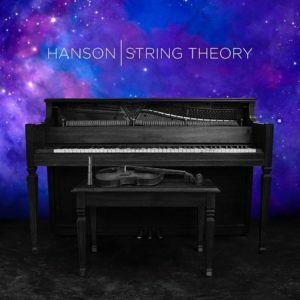 While you can read our review of the first disc here, on disc two of String Theory, Hanson turns to the lesser known songs in their catalogue, with some only diehard fans will recognize. While the first String Theory disc felt lively and enchanting, the idea of placing lesser known tracks on this disc made it more of a letdown to listen to. Opening with “Reaching For The Sky (part 2),” we hear middle brother Taylor’s great piano skills, which he has become incredibly adept at for over 20 years of playing. Another solo from him is present here, and it’s a highlight of String Theory. Next is “This Time Around,” a fan favorite and a staple at the group’s live shows. Sounding beautiful in almost any setting, its nearly impossible to screw up the song, and thankfully the trio have handled “This Time Around” with care, leaving the strings to balance out the song and not overpower it. “You Can’t Stop Us” is a track off of 2013’s Anthem, and the first number on this disc where youngest brother and drummer Zac takes the lead vocally, with oldest brother Isaac playing the distinctive riff that accompanies the song, reminding listeners of the group’s older influences. While you wouldn’t normally think of “You Can’t Stop Us,” as a song that would normally be backed by a symphony, in this case it works and luckily the strings were placed in the right places for “You Can’t Stop Us” to still feel like a proper rock track. Tunes such as “Broken Angel” and B-side “Breaktown,” are two of Hanson’s best songs, however on String Theory they tend to fall flat early on. While the brothers have said that all songs in their discography were up for getting picked, the motivation for why they picked these tunes has not been made public. Their newer song “I Was Born,” released last year, falls into the same camp, and struggles to find its place in the track listing. The ending is redeemed by placing “Tonight” at the end of the album. Another smooth pop song, Hanson have done another excellent job at placing the orchestra where it should be – as an accompaniment. Despite a few faults, String Theory as a whole sounds and feels ambitious without being overly so. With this double LP under their belts, the sky is the limit for the band that could have easily faded into one hit wonder land. Listen to “You Can’t Stop Us” below.